My love for the Go-Go’s began with my first Sony Walkman and the first cassette I bought to play in that Walkman: “Beauty and the Beat,” the debut album from the Go-Go’s featuring “We Got the Beat,” “This Town” and “Our Lips Are Sealed.” Almost 40 years later, I still have great affection for Belinda, Charlotte, Gina, Kathy and Jane, my first delicious taste of girl power before I even knew what that was. 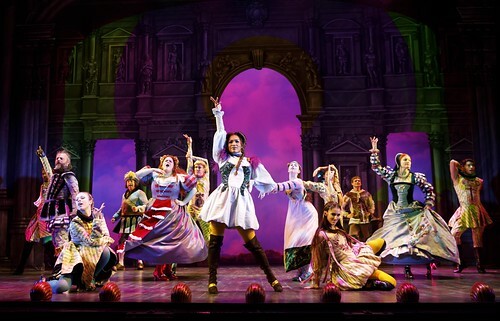 How thrilling, then, to find the songs of the Go-Go’s fashioned into a fizzy new jukebox musical, Head Over Heels with the inventive concept of folding the punky-poppy ’80s tunes folded into a (greatly) adapted version of Sir Philip Sidney’s late 16th-century Arcadia. You’ve got song and text separated by more than four centuries, so it’s a mash-up of sensibilities with lots of room for cheeky humor and the exploding of gender norms. All of that was on display when Head Over Heels opened April 18 at the Curran theater, but a lot has changed since the show’s first production three years ago at the Oregon Shakespeare Festival. The whole creative team, headed by director Michael Mayer (Spring Awakening, American Idiot, Hedwig on Broadway), is new, including book writer James Magruder, who replaces Jeff Whitty (Avenue Q), who conceived this wacky idea in the first place. There’s a whole village of producers ahead of the title, including the Curran’s Carole Shorenstein Hays and Oscar-winner Gwyneth Paltrow, and an opening date on Broadway looming in the very near future (July). As the out-of-town tryout before heading to Broadway, the production at the Curran reveals a show that is fizzy and fun (especially for those of us ga-ga for Go-Go’s) but with work still to be done before a New York bow to make the show really come together. Sidney’s Arcadia surfaces here mostly to provide framework for a road trip comedy as the royal family of Arcadia attempts to outrun a doomsday prophecy by journeying to Bohemia. Otherwise, this is a pretend period comedy with a checklist of modern issues to address: lesbian love, inept men yielding power to more competent women, trans people achieving god-like status, certain body shapes subverting other body shapes to dismantle the beauty standard, cross-dressing men who access the divine female within and on and on. As checklists go, that’s a pretty great one, but you can feel the effort behind each tick mark. With the Go-Go’s fueling the party (and an all-female band headed by Kimberly Grigsby that, unfortunately, we don’t get to see until the curtain call), there’s a mighty girl power vibe emanating from the stage, and that’s fantastic. Nothing against the male members of the cast, but how great would it be to go all the way and make this an all-woman cast. The original text is a relic from the 16th century when women weren’t allowed on stage, so let’s make up for some lost ground and just set the women loose on all the roles. And let’s make the band visible for all of the show’s 2 1/2-hours while we’re at it, which might mean eighty-sixing the flat “pastoral” set pieces by Julian Crouch, which, at best, feel like they’re borrowed from an old tour of Kiss Me Kate. As is, Head Over Heels feels too polite and could use a little anarchy, some punk-lite to rough up the edges and make songs like “Lust to Love” and “Skidmarks on My Heart” and “Automatic Rainy Day” come to life even more. This is an enjoyable show, but I craved something bolder, edgier and even more cranked up. The Go-Go’s songs sound great (music supervision, orchestrations and arrangements by Tom Kitt), and because they’re not theater songs, they don’t carry a lot of emotional weight (and sometimes don’t fully make sense, but who cares?). The title song, for instance, “Head Over Heels,” is a zippy Act 2 opener in which couples frolic. The more apt title for the show might be “We Got the Beat,” the show’s opener and a rather belabored attempt to tell us how Arcadia is special because of its passionate pulse or, if you will, its beat. At a certain point in the plot, Arcadia loses its beat, and the bright, jewel-toned colors of Kevin Adams’ lighting design fade and the stage goes blah. So keeping the beat is central to the show – why not the title? What is most definitely not blah here is the cast, even when the material lets them down (like the entire ending). As the king and queen, Jeremy Kushnier and Rachel York get to be adulterous (with each other, no less), though it takes too long for us to hear York let loose with her glorious voice. She also gets saddled with an eye-roller of a monologue (about that elusive beat) that she conveys with such poignancy that it actually works. As sisters Pamela and Philoclea, Bonnie Milligan and Alexandra Socha respectively get to explore vanity and sincerity. Pamela has to figure out why her hordes of suitors leave her so cold, while Philoclea wrestles with her love for a humble shepherd, Musidorus (Andrew Durand), an inappropriate match for a princess. Durand gets to do some major cross-dressing as an Amazon warrior, and he is as hilarious as he is endearing. He even makes the song “Mad About You” (not, technically, a Go-Go’s song but a solo hit for Belinda Carlisle) sweet instead of schmaltzy. Taylor Iman Jones oozes charm as Mopsa, a narrator of sorts who breaks the fourth wall to move the plot along when necessary, and a major player in one of the romances. And then there’s Peppermint, the second-runner-up in Season Nine of RuPaul’s Drag Race, playing Pythio, the Oracle of Delphi, savoring every quip and ounce of attitude the role has to offer. The entire ensemble works hard to keep the energy level up, and if choreographer Spencer Liff’s moves are heavy on the hand-jive, there’s still a lot of verve, though not a lot of meaning. 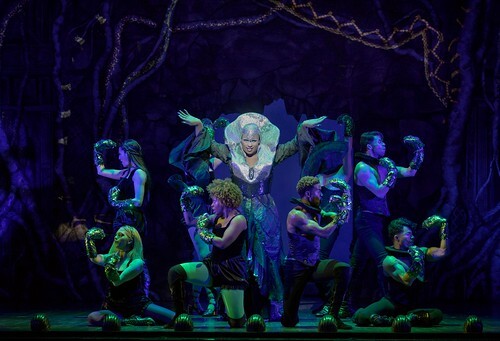 After a dud of an ending, Head Over Heels cranks up the volume for the curtain call, reveals (at long last) the band at the back of the stage and invites the audience to get on their feet because they know we can dance to the beat. We may not jump and get down, but we can go round and round and round the idea that this is a show still finding itself, though it has most definitely got the beat. Head Over Heels continues through May 6 at the Curran Theatre, 445 Geary St., San Francisco. Tickets are $29-$175. Call 415-358-1220 or visit www.sfcurran.com.